In the right lane of the street. In the center of the street. In the left lane of the street. In the lane with the least traffic. If you are turning left from a two-way street onto a one-way street, you should complete the turn into the lane closest to the lane you have just left. Backing out of a driveway. Already within a traffic circle. A driver who enters a traffic circle or rotary must yield the right-of-way to drivers already in the circle. Vehicles entering a roadway from a driveway must yield the right-of-way to pedestrians and to vehicles already in the road. When leaving a parking space, you must yield to oncoming traffic. Which of the following statements is true about BAC (blood alcohol content)? The breathalyzer is a test to determine a person's BAC. A chemical test for BAC is needed for an alcohol conviction. BAC levels are reduced by a person's physical fitness. After drinking, coffee or a cold shower will lower your BAC. A breathalyzer is a chemical test to determine a person's BAC. A chemical test is not required for the conviction of an alcohol-related offense. A police officer's testimony about how a person was driving, or their appearance and behavior when arrested, is enough. Stop only for traffic on an intersecting road. 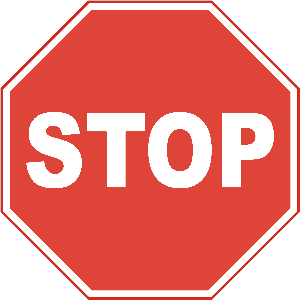 A stop sign means that you must come to a full stop and yield the right-of-way to vehicles and pedestrians in or heading toward the intersection. Go again when it is safe.